Sweet basil plants are susceptible to a wide variety of insect pests that can cause significant damage. Certain types of insects, such as cutting insects that consume large portions of plants, can destroy your sweet basil. Identify insects that feed on basil as well as reliable control methods for successful growth of your home garden plants. Proper care of basil plants results in vigorous growth and a lessened vulnerability to insect infestation. Plant your sweet basil in full sun. 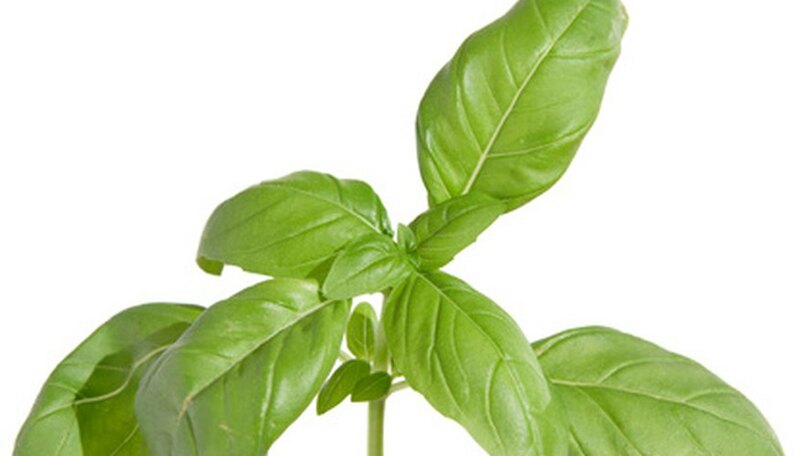 Sweet basil plants thrive in warm, well-drained loam soil with a pH of 6.4; cold temperatures will injure basil plants. When possible, grow basil in raised beds for warmer conditions and better drainage, according to the North Carolina Cooperative Extension Service. Cutworms are insects that infest sweet basil plants, according to the University of Florida IFAS Extension. These insects are caterpillars with short bodies. Black cutworm caterpillars (Agrotis ipsilon) have bodies that look as though they are covered in grease and they have the capability to cut down a full plant. Reaching .01 inch in length, tiny twospotted spidermite insects display reddish, brown, green, yellow-green or see-through bodies, according to the University of Florida IFAS Extension. Cabbage loopers (Trichoplusia ni) display green bodies with white stripes, according to the University of Florida IFAS Extension. Mites, particularly twospotted spider mites (Tetranychus urticae) attack sweet basil plants. These "sucking" insects feed on plant tissue fluids. Inhabiting undersides of sweet basil leaves for feeding, twospotted spider mites create webs on their host plants, as their name suggests. Look for spotted leaves or total leaf drop from the sweet basil plant. Black cutworms feed closer to the soil line, eating leaves and essentially "cutting them" from the plant as their name suggests. Adult cabbage loopers are moths that lay their hundreds of eggs in deposits of up to seven eggs at a time on sweet basil plants. Within four days, the hatched larvae chew and consume leaves. Within four weeks, look for further evidence of infestation when they form cocoons on the sweet basil plant, according to the University of Florida IFAS Extension. For mild insect infestations, hand removal of caterpillars as well as removal of mites with a strong stream of water is a natural option. Add mulch like straw to the soil surrounding basil plants, according to the North Carolina Cooperative Extension Service. Mulch increases moisture conservation and prevents the growth of invasive weeds that may act as initial host plants to pests that may then infest sweet basil. For chemical control of more severe insect problems on sweet basil plants, apply those insecticides formulated for use on sweet basil for particular insects. For caterpillars, apply azadirachtin up until the day of harvest, according to the University of Florida IFAS Extension. For chemical control of mites like twospotted spider mites, apply sulfur to your sweet basil plants.